OGCA Home » Project Lifecycle » Proposal Submission » What Does OGCA Review? Full Proposals vs. Pre-Proposals, Notices of Intent (NOI), Letters of Intent (LOI), White Papers, Concept Papers, etc. A full proposal is either submitted in response to a funding opportunity announcement (FOA) or as an unsolicited submission. It formally commits University personnel time/effort, facilities, or other resources and therefore requires internal institutional approvals. Sometimes sponsors initially require applicants to submit a "pre-proposal", "notice of intent", "letter of intent", "white paper", or "concept paper" in order to be eligible to apply for a program or be invited to submit a full proposal. For purposes of these outlined procedures, the term “pre-proposal” is used to describe all the terms noted above (list may not be all inclusive). What Requires OGCA Review and Approval? UAF approval guidelines for proposals depend wholly upon sponsor requirements and the commitments written into the proposal. All full proposals (as referenced above) require OGCA final review and endorsement. A pre-proposal submitted to a sponsor in response to a limited submission funding opportunity announcement. Note: Internal whitepapers prepared for UAF Limited Submission Committee review do not require OGCA review. The sponsor requires Authorized Organizational Representative (AOR)* signature, approval, or submission of any document. If a pre-proposal is not subject to either of the conditions listed above, it can be submitted directly to the sponsor without OGCA review. If you are unsure, please contact our office. "The information provided in this document is for discussion purposes only. It does not represent a firm quote and it does not commit UAF personnel, facilities, or funds. Final terms and conditions of this sponsored activity are subject to UAF review and authorization of a formal proposal or agreement." 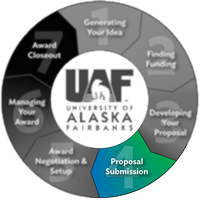 Care must be taken to ensure that any activities prior to submission of a formally-approved proposal on behalf of UAF do not create any University commitments. *Per UA Board of Regents policy and delegated via the UAF Chancellor, the designated AORs for UAF are the OGCA Executive Director and Associate Director. Note on Banner FRAPROP Entry: All pre-proposals should be entered into Banner FRAPROP as the type "PP". If selected to be submitted as a full proposal, it can then be changed to the relevant proposal type (NC), using the same S number. If a pre-proposal does not require a budget, it should be left at a zero dollar amount until a full proposal is invited for submission. Banner entry does not require review by OGCA Pre-Award. If you have questions or are unsure about these guidelines, please contact our office. What Else Does OGCA Review?